Linking digital offers with physical retail locations and playing a key role in the “path to purchase” has long been the promise of mobile. Tracking the effectiveness of mobile campaigns from smartphone impression to completed offline transaction, however, hasn’t been so simple. A pilot campaign launched by Auntie Anne’s Pretzels and The Coca-Cola Company aims to close the loop by tracking mobile coupon redemptions at the point-of-sale through technology supplied by Sparkfly. The company’s software platform is integrated with major retail POS systems including NCR, MICROS, IBM and Verifone to track redemptions from mobile Web-based promotions. The campaign running on mobile ad network Millennial Media through mid-August will test different combinations of Auntie Anne’s and Coke items for purchase at 10 Atlanta-area locations of th soft pretzel chain. Each ad will contain a unique four-digit redemption code from Sparkfly that allows the item-level tracking of individual sales. At checkout, a user who clicked the ad to receive the coupon would then show the cashier the promotion code on their phone, which would be entered into the POS system to deliver the savings. In conjunction with Millennial’s analytics, Auntie Anne’s and Coca-Cola aim to gain insight on campaign performance that goes well beyond clicks. With more than 1,170 franchise locations globally, the pilot involves just a small fraction of its outlets, found often in malls and airports. Prior to Auntie Anne’s, Millennial hadn’t run campaigns that include POS tracking. But depending on the results of the new promotion, the company indicated it might work more closely with Sparkfly to provide that capability as part of its analytics offering going forward. 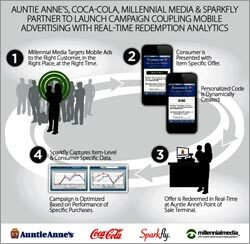 The ad network also emphasized the use of redemption-tracking as a tool to help to fuel local advertising in mobile. “Marketers are shifting local market advertising spend into mobile and are driving real world value in a way not possible with more traditional channels,” said Marcus Startzel, general manager at Millennial. Retail and restuarants were the fourth-largest ad category on Millennial’s network in the first quarter, in terms of spending, behind telecom, finance and travel.